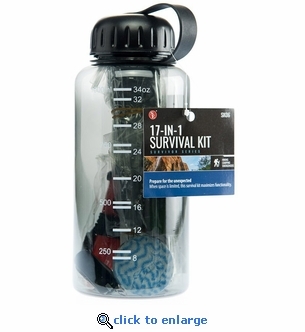 Our Survivor Series 17-in-1 survival kit comes packaged in a BPA-free water bottle and has a wide variety of supplies for emergencies, camping, hiking and more. Be prepared on your next camping or outdoor Adventure with our 17-in-1 survival kit that included many of the items you may need in the wilderness or on an outdoor outing. Prepare for the unexpected when space is limited with this compact, light weight, survival kit that maximizes functionality. Expandable Towel: - Expanded 22-1/4" x 13-1/8", compressed 1-3/4" - water activated � biodegradable - 100% durable Rayon. How to expand expandable towel: Uwrap from plastic. Add water to the towel. Allow towel to expand. How to start fire with magnesium fire starter: use the striker to shave a quarter sized Pile of magnesium. Scrape the striker against the flint rod to create a spark. Expandable Towel: 11" x 23"
Emergency Blanket: 52" x 82"